Its been so long since my last post. Oops! I was out of town for a little while for work, and I'm slowly getting back on the crafting ball. My most recent completed item was a little gag gift for one of my sisters. Apparently she thought one of the lyrics in the song "Here comes the Hotstepper" said: I'm a leprechaun gangster. This amused her boyfriend a lot. 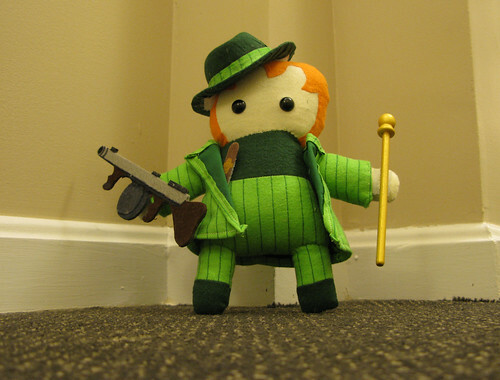 Enough so, that he contacted me and asked me to make a leprechaun gangster plush for her as a surprise. I believe you, but my tommy gun don't! I had a lot of fun making him, even though I ended up having to pinstripe the fabric myself with a ruler and sharpie marker. 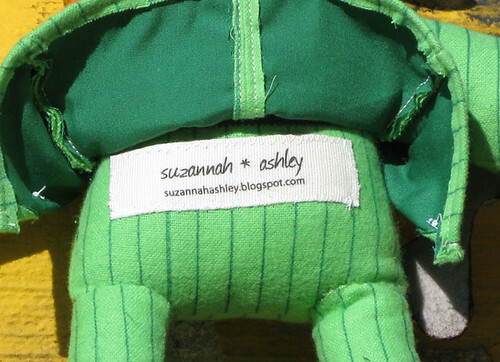 I just couldn't find a pinstripe fabric I liked, and in green no less. And I really love his little felt tommy gun. Also, he's showing off my spiffy new labels I got a few months back. From what I hear, he was very well received. :D Now I want to make a little plush version of my boyfriend with his fedora that he wears. Will have to add that to the to do list. By day I'm a graphic design and production monkey. Once the workday ends, I morph into an aspiring craft superstar. I don't care what the material is, I love to create from anything I can get into my grubby little hands. Original artwork © Suzannah Eller. Simple theme. Powered by Blogger.